When kids were young, some cheap plastic replicas of cars were great presents, they loved playing with them and those little cars could keep them entertained for hours. The only apparent downside is all the sores you end up getting on your feet from stepping on one of the hundred of those little cars that are bound to be strewn across the floor. That’s simply a price you’re going to have to pay for now. Once those kids get older, they’ll want faster cars that can race and move on their own, when that happens, you’ll need to get the much more expensive, but, at the same time, much cooler Carrera Evolution Pro-X Indy Digital Slot Racing System (I don’t plan on repeating that entire name again in my life). The track design doesn’t look terribly interesting, but what might interest you is what’s inside the two 1:32 scale model cars. A little hint, it’s digital chips that end up making slot racing fun. Now cars can change lanes, even when going full speed, actually making the race interesting. And changing lanes isn’t computer controlled; with your forefinger you can send the “change lane” command while your thumb handles acceleration and braking. 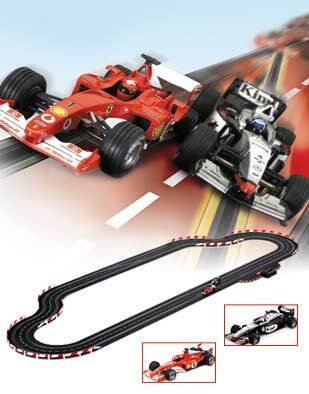 The two cars included are a McLaren Mercedes Benz MP and a Ferrari F2002, although you can purchase others, and the track can handle up to 4 cars at a time. As I said before, this slot racing system is pretty cool, but unlike those old plastic cars, it doesn’t carry a $3 price tag, instead it’s $250. Maybe just get your kid interested in something cheaper, like Play-Doh.